The 2017 Umbrellas of Bermagui will be unfurled this Australia Day ahead of the Bermagui Seaside Fair in March. Over the last three years this unique fundraising idea has raised over $14,000 for local youth projects. The idea is one borrowed from the community of Harbert in Michigan USA, who have been running a similar event for many years. Bermagui resident and ex-pat American, Dennis Olmstead is the link and is delighted with the local response. 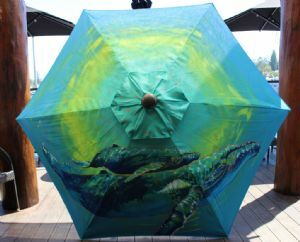 “What I love about the Umbrellas of Bermagui is the colour of the umbrellas, the connection to the community and the financial contributions to our local youth groups,” Mr Olmstead said. Local businesses sponsor a 2.5 metre shade umbrella. Each one is then hand decorated by a local artist and auctioned on the day of the Bermagui Seaside Fair, 11th March 2017. “The look and feel of the artwork is a collaboration between the sponsor and the artist,” Mr Olmstead said. The official launch will be held on Australia Day at Bermagui Country Club from 11am to 3pm where all the decorated umbrellas will be on display, before moving around town to various sponsors. On the day of the Fair the umbrellas are paraded and displayed on Dickinson Oval allowing maximum viewing for each before the auction. Bega Valley Shire Council and the Bermagui Library is proud to support the event and host two of the umbrellas at the Bermagui Community Centre until February 20.